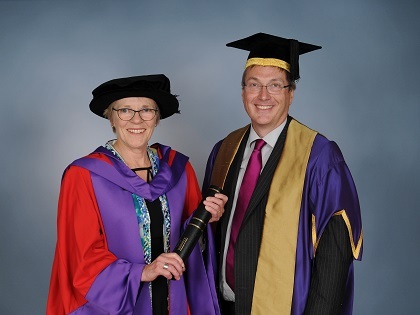 Trailblazing lawyer Dr Julie Maxton has received an honorary doctorate from the University of Warwick. Dr Maxton (pictured right, with Vice-chancellor Stuart Croft) is Executive Director of the Royal Society, the UK’s oldest learned society, and is the first woman to hold that role. She was made Honorary Doctor of Laws during Warwick’s summer degree ceremonies. Called to the bar in the late 1970s, Dr Maxton combined a career as a practising lawyer with that of an academic and an administrator, holding a number of senior academic and university positions, including those of Deputy Vice Chancellor, Professor and Dean of the Faculty of Law at the University of Auckland, New Zealand, and Registrar of the University of Oxford. In the era of ‘fake news,’ Dr Maxton sees the Royal Society as having a vital role in standing up for hard facts. She said: “The Royal Society has a really important job in looking at the facts, and placing the facts in front of people who can make decisions. Speaking about her career, in which she has combined being a practicing barrister with teaching and research, and taken on a number of senior university administration roles, excelling in each field, Dr Maxton said: “I didn’t plan it that way – I think life takes you down different alleyways that you didn’t know existed or didn’t know you were going down! “But I have always enjoyed practicing in the courts when I was teaching law, because I think it really helps to be able to explain to the students why certain things weren’t argued and why cases take the course they do. “I’ve always thought the practicality of the law as well as the theory is very important. And that’s one of the strengths of Warwick – in Warwick law degrees students get practical training, and in the past that has been less common than it is now. Listen to the full interview with Dr Maxton on YouTube. Dr Julie Maxton is the Executive Director of the Royal Society, the first woman in 350 years to hold the post. Before taking up her position at the Royal Society in 2011 Julie was Registrar at the University of Oxford, the first woman in 550 years in the role. She is an Honorary Fellow of University College Oxford, a Bencher of the Middle Temple, a Freeman of the Goldsmith’s Company, and a Board member of the Charities Aid Foundation, the Alan Turing Institute and the Faraday Institute. In the past she has also been on the Boards of the Blavatnik School of Government in Oxford; Haberdasher Aske’s School (Elstree) and Engineering UK. Academic and other recognition Julie has received include a CBE (2017) and Honorary Degrees from the Universities of Huddersfield (2016) and Canterbury (2017). She is the author of numerous articles concerned with trusts, equity, commercial and property law.